Junior Hannah Angeli sets one up for Erica Haslag during the CEFCU Invitational at Renaissance Coliseum. Photo by Kayla Johnson. The Braves are off to a hot start on the volleyball court. In fact, it is the best start since the 2012 season. 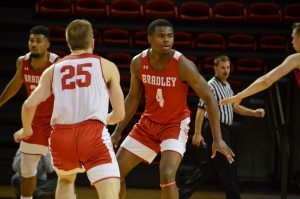 This past weekend, Bradley (7-2) headed south to Gadsden, Alabama to participate in the Gamecock Classic. 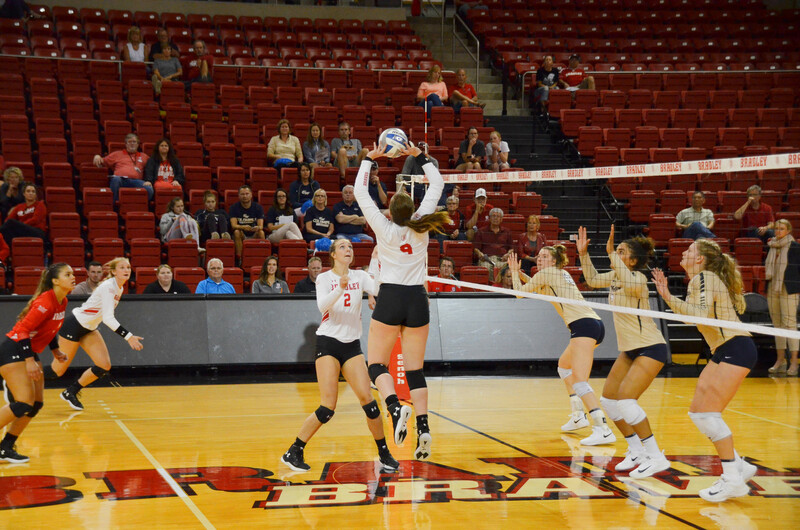 The team returned to Peoria after winning two of three matches, falling only to host Jacksonville State. Head coach Carol Price-Torok said she is proud of her program’s growth. 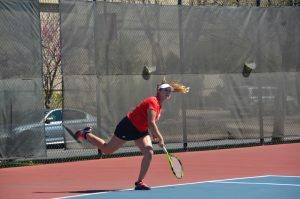 The Braves began the tournament with a sweep of Western Carolina on Friday. Later that night, it fell in five sets to tournament host Jacksonville State. The match was tightly contested and the Gamecocks knocked off the Braves 15-13 in the final. On Saturday morning, Bradley came out firing and swept Mississippi Valley State behind an effective combined team hitting percentage of .432. Senior middle blocker Alyssa Schovanec and junior setter Hannah Angeli were named to the all-tournament team. Schovanec has been pushing herself to spark rallies this fall and did just that this past weekend. Although the Braves fell to the Jacksonville State, Schovanec had her best collegiate match by hitting .600 and notching a career-high 12 kills. In past years, the Bradley volleyball program has relied on one or two players to shoulder the scoring load. This year is different, according to Price-Torok, as new players, and returners such as Schovanec, have begun to contribute more both offensively and defensively. Although the Braves have played well during the nonconference slate, they understand that Missouri Valley Conference games are most important. They are preparing each day for two months of strong MVC competition. “Starting fast means a lot for our team and the momentum we are creating is going to really push us forward into conference play,” Schovanec said. Tonight, the Braves host the CEFCU Classic, their last weekend tournament of the season with Omaha, Nebraska and Eastern Illinois visiting the Renaissance Coliseum. Price-Torok said she looks forward to the test the teams will pose to the Braves. 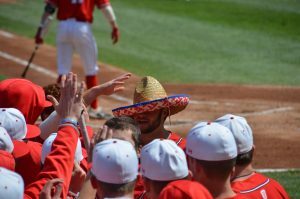 Bradley will host Eastern Illinois (3-8) at 12:30 p.m. today, Omaha (4-5) at 7 p.m. tonight and Milwaukee (0-10) at 2 p.m. Saturday.